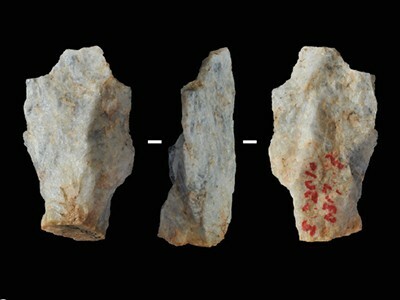 An excavation has uncovered stone tools in China that are about 2.1 million years old. This evidence pushes back the date of the earliest established signs of a hominin species outside Africa. John Kappelman is in the Departments of Anthropology and Geological Sciences, The University of Texas at Austin, Austin, Texas 78712, USA. Imagine a world nearly devoid of humans. This theme is often explored in post-apocalyptic science fiction, and it was the case for most of Earth’s history until early hominins (members of the evolutionary tree that includes humans, extinct species of the genus Homo and other closely related bipedal species) moved out of Africa into unknown territories, to eventually populate the planet. Which hominins made this journey? When and how did they migrate, and by which routes? Field-based research that uncovers traces of these early dispersals could provide some answers, as well as insight into hominin behaviour. In a paper in Nature, Zhu et al.1 report evidence of hominin activity in China more than 2 million years ago, revealing an earlier time frame than was previously known for a hominin presence outside Africa. Establishing the first known occurrence of a species requires incontrovertible evidence to confirm the presence of the species and firm support for the age of the geological material that contains such a sample. The remains of species that were common where they lived are usually found with ease in fossil deposits. By contrast, populations of ancient hominins were probably rare, and their fossilized remains are generally scarce. Just a single finger bone can suffice to document a hominin presence2. However, when hominins began to fashion tools from stones, at least 3.3 million years ago3, the purposely chipped cobbles and flakes that they produced became another calling card that can attest to a hominin presence. Until now, the oldest known hominin site outside Africa4 was in Dmanisi, Georgia. Excavations at that site uncovered spectacular finds of the roughly 1.85 million- to 1.78-million-year-old remains of multiple hominins and stone tools. Numerous later sites of hominin activity, at locations stretching from western Europe5 to eastern Asia6, have also been investigated thoroughly. Zhu and colleagues’ report of signs of a hominin presence at Shangchen in China’s Loess Plateau (Fig. 1) is based on evidence from only stone tools, and the researchers found that these tools were distributed in layers of sediment that date back to about 2.1 million years ago. 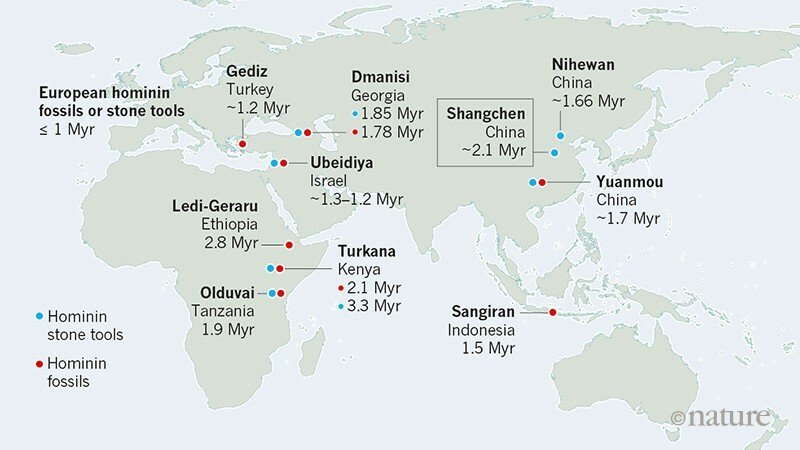 Figure 1 | Ancient sites of hominin presence. Zhu et al.1 report their discovery of approximately 2.1-million-year-old stone tools at Shangchen in China’s Loess Plateau, which provides the earliest known evidence for the presence of hominins (the evolutionary group that includes humans, extinct species of the genus Homo and related bipedal species) outside Africa. The dates (Myr, million years ago) and locations of some of the important earliest known sites of hominin fossils and stone tools are shown. The age of many hominin sites has been estimated by methods such as radiometric dating, or by the chemical fingerprinting of volcanic rocks. Because Shangchen lacks volcanic rocks, Zhu and colleagues instead used palaeomagnetic dating to analyse sediment layers called palaeosols (fossilized soils) and loess (wind-blown silts). This technique relies on the fact that Earth’s magnetic field undergoes random reversals7, in which the magnetic north pole becomes the magnetic south, and vice versa. Magnetic minerals in sediments act like small compasses that register the polarity, and when such sediments become rock, the polarity of that time is locked in. The pattern of polarity reversals in these ancient sediment layers provides a fingerprint that can be matched to a dated reference called the geomagnetic polarity timescale (GPTS)8. The site at Shangchen contains steep, deeply incised outcrops that include slopes covered in vegetation, which makes sample collection a literal cliffhanger. The authors’ data provide a convincing correlation to the GPTS, and the team was able to identify two notable events from the GPTS (the brief Réunion Subchron9 and the later, but slightly longer, Olduvai Subchron), which bookend the layer that contains the oldest artefacts. Can we be certain that the researchers found the oldest tools at the site? The team’s ability to reach the deeper layers was limited because of the present active farming of the fields. Investigating such layers should be a goal of future work. The 96 excavated stone tools that Zhu et al. analysed were mainly small stone flakes and cobbles, which contrasted sharply with the fine-grained material that surrounded the artefacts. The authors propose that hominins transported these rocks from the Qinling Mountains to the south. If the exact source of the stones could be determined, it would provide important information about how far these hominins transported raw materials. The stone tools are simple in form: the palm-sized rock cores had a limited number of flakes removed, with some of the flakes showing an apparent subsequent resharpening, and several cobbles might have been used as hammerstones. These characteristics closely align the Shangchen tools with those of a similar age found in Africa10. The authors do not report any matching refit of flakes to each other or to the cores from which they were chipped, so flake production might have occurred elsewhere. However, because the steepness of the slopes at the site rarely permitted the team to open large excavations, this prospect remains to be examined thoroughly. What were the stone tools used for? Zhu et al. note the discovery of animal remains near the oldest tools, including bones belonging to bovids (a family that includes antelopes and cattle), cervids (comprises deer) and suids (pigs). The authors did not address whether this association provides evidence of tool use for carcass processing. To evaluate the possibility, it would be necessary to identify signs such as: cut marks on the bones that point to flesh removal with tools; breakage marks on the bones, suggesting that they had been hammered to extract bone marrow; tool wear; or the presence of trace biological residues on the tools. If this question is investigated in the future, the degree of post-recovery cleaning of the stone tools might have compromised the use of approaches11 such as residue studies. Hominins originated in Africa possibly more than 6 million years ago12. The absence in Eurasia of both any hominin sites dating to the early portion of this interval and any fossils that can be attributed to hominin genera such as Australopithecus and Paranthropus, found in Africa until about 1 million years ago, points instead to a species of Homo as the most likely candidate for the first hominin to have left Africa. The oldest known African fossil attributed to Homo is a 2.8-million-year-old jawbone from Ethiopia13, which provides a time estimate for the earliest possible exit of the genus from Africa. Of course, the actual date of departure might have been later. The hominin dispersal probably occurred under the variable climates of the Pleistocene ice age. Does a migration to higher latitudes suggest the evolution of behavioural adaptations to colder climates? Perhaps. The conventional interpretation that the palaeosols of the Loess Plateau formed during favourable warm and wet conditions, and its loess under harsher cold and dry conditions, is probably an oversimplification14, but at the Shangchen site, palaeosol layers containing stone tools outnumber loess layers containing such tools by a ratio of about 2 : 1. Rather than maintaining a continuous occupation of the Loess Plateau, the hominin population might have increased or dwindled, depending on the climate15. The roughly 14,000-kilometre trek from eastern Africa to eastern Asia represents a range expansion of dramatic proportions. The dispersal of hominins was probably facilitated by population increases as they moved into new territories and filled empty niches, and could also have been driven by the phenomenon of resource depletion that underlies the high mobility of today’s hunter-gatherers16. Yet even with a dispersal rate of only 5–15 kilometres per year, a value well inside the daily foraging range of modern hunter-gatherers17, the distance between Africa and Asia could have been covered in just 1,000–3,000 years. The present record of hominin sites and the dating techniques that are currently available to researchers are not sufficient to resolve a dispersal event of such potential speed, or to determine its exact form, but we can surely look forward to more finds that will help to solve this migration mystery. Zhu, Z. et al. Nature 559, 608–612 (2018). Harmand, S. et al. Nature 521, 310–315 (2015). Ferring, R. et al. Proc. Natl Acad. Sci. USA 108, 10432–10436 (2011). Muttoni, G., Scardia, G. & Kent, D. V. Quat. Sci. Rev. 180, 1–29 (2018). Zhu, R. X. et al. Nature 431, 559–562 (2004). Phillips, J. D. & Cox, A. Geophys. J. Int. 45, 19–33 (1976). Ogg, J. G. in The Geologic Time Scale 2012 (eds Gradstein, F. M., Ogg, J. G., Schmitz, M. D. & Ogg, G. M.) 85–114 (Elsevier, 2012). Quidelleur, X., Holt, J. W., Salvany, T. & Bouquerel, H. Geophys. J. Int. 182, 699–710 (2010). Shea, J. J. in Out of Africa I (eds Fleagle, J. G., Shea, J. J., Grine, F. E., Baden, A. L. & Leakey, R. E.) 47–64 (Springer, 2010). Nowell, A. et al. J. Archaeol. Sci. 73, 36–44 (2016). Klein, R. G. The Human Career 3rd edn (Univ. Chicago Press, 2009). Villmoare, B. et al. Science 347, 1352–1355 (2015). Stevens, T. et al. Nature Commun. 9, 983 (2018). Prat, S. C. R. Palevol. 17, 6–16 (2018). Venkataraman, V. V., Kraft, T. S., Dominy, N. J. & Endicott, K. M. Proc. Natl Acad. Sci. USA 114, 3097–3102 (2017). Kelly, R. L. The Lifeways of Hunter-Gatherers (Cambrige Univ. Press, 2013).